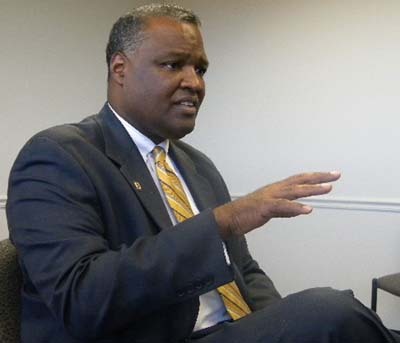 It went under the radar last month, but some parents are calling for the resignation of Prince George’s County Executive Rushern Baker for his involvement in the Prince George’s County Grade Fixing scandal. Systematic grade change epidemic has become a culture in the county. Frustrated with corruption surrounding county, and including PGCPS administration. Standing in representation of parents, community leaders and groups of Prince George’s county in calling for the resignation of PGCPS CEO, Deputy Superintendent, area Instructional Directors, and County Executive. Requesting transition to a PGCPS Board of Education elected by Prince George’s County Residents. Spoke of PGCPS administration’s involvement in grade change scandal due to prior knowledge of unauthorized grade changing or failure to bring attention to matter prior to audit. Spoke of no improvement of PGCPS since the arrival of current CEO, Dr. Maxwell. Spoke of unfavorable reputation of Deputy Superintendent, appointed by Dr. Maxwell. Speaking on disappointment in lack of transparency regarding the graduation rate audit. Dysfunction of PGCPS Board of Education, along with nepotism and cronyism is largest contributor to grade change scandal. Lack of oversight and irresponsibility of CEO, Deputy and Associate Superintendents, along with Instructional Directors is proof of necessary change in PGCPS administration. Spoke of “witch-hunt” beginning with those following orders. Administration needs to take responsibility for lack of leadership. PGCPS students and teachers have been disgraced by past and current events within PGCPS. Current and future PGCPS graduates fear scrutiny of their transcripts, and school system has been marred by scandal. Accused board members of pledging loyalty to county executive, rather than the job that they have sworn to perform. Their focus does not seem to be directed towards preparing every PGCPS student for future academic and professional endeavors. Still another speaker demanded legislation that would repeal the law that allows the Prince George’s County Executive to appoint the Board of Education members. This law allowed Baker to fill the Prince George’s Board of Education with his cronies, who let this grade inflation scandal happen on their watch. This scandal will become a focal point of the race for Governor as Baker uses his record on education as a keystone of his campaign. Sadly, Baker’s record is one that focused on doctoring the results of grades in order to make Baker look good politically rather than actually improve education and the ability of Prince George’s County students to succeed.